On a recent trip to Mana Pools National Park in the far north of Zimbabwe, John and Linda Marais were enjoying an al fresco dinner near Nyati Lodge when they were interrupted by an eland bull looking a little uneasy as it made its way towards the nearby Zambezi River. 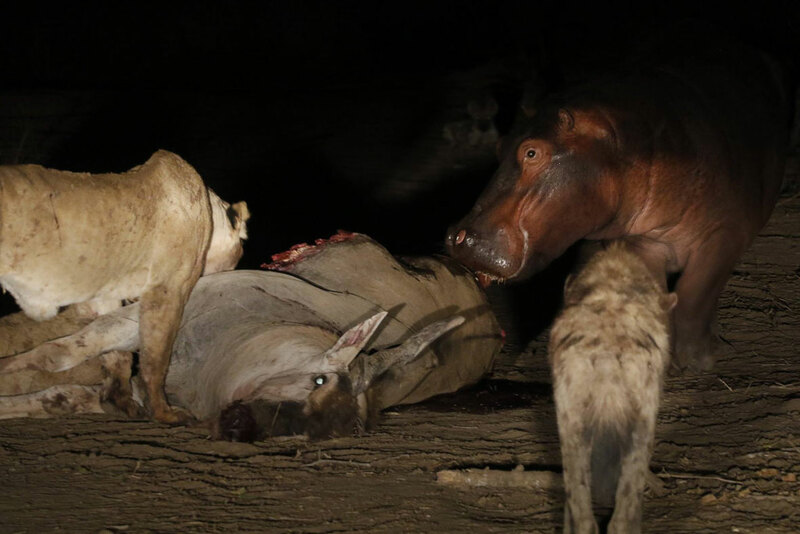 Assuming it was their torchlight that had perturbed the massive antelope, the couple flicked off the flashlight and turned their attention back to their meal. Just 10 minutes later, the peaceful lull of the bushveld was shattered by a commotion somewhere in the surrounding blackness. "The torch was rapidly flicked back on, just in time for us to see the eland, about 20 metres from our party, racing back in the direction from which it came," they wrote in a Facebook post. This time, though, the buck was carrying a lion on its back and the more were snapping at its tail. A cacophony of cackles signalled the arrival of hyenas to the fray, as the Marias party quickly packed up their dinner dishes and headed back to the lodge. Once safely inside, the group could just make out the shapes of animals tussling in the darkness at the end of the access road leading to the lodge. John and Linda decided to move to their vehicle and make use of its headlights to illuminate the action. 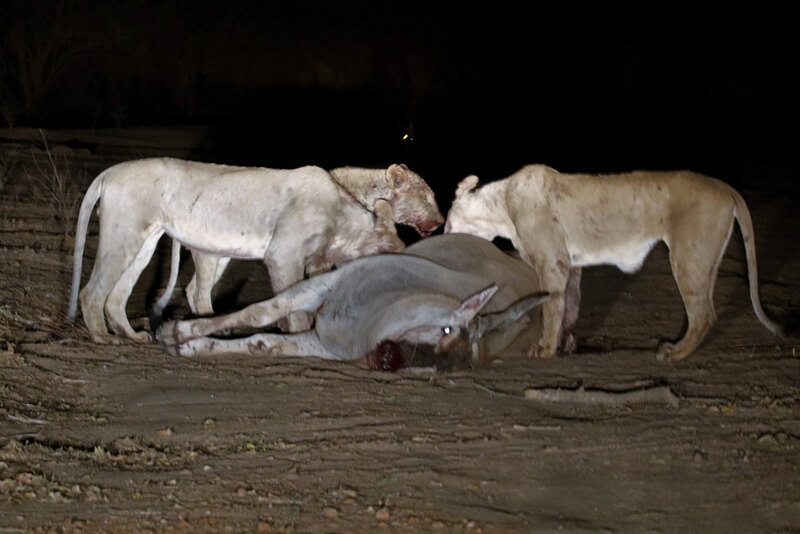 "In the middle of the road, we saw two lionesses and one young lion fiercely gripping the eland," they explained. An adult eland bull can weigh over 900 kilograms (1,984 lbs) and it took the big cats 15 minutes to ground the buck, and another 20 to dispatch their prey. A short while after tucking into their sizeable meal – pausing at regular intervals to chase off opportunistic hyenas that had sidled too close – something captured the attention of the cats. A crocodile, likely attracted by the commotion, had made its way some 50 metres out of the Zambezi River to investigate the scene. It was chased off by the hyenas before it could reach the carcass, "but its presence was quickly replaced by another visitor – an inquisitive hippo, who made a beeline towards the kill and quickly began licking up blood from the animal’s rump," the Marais recall. 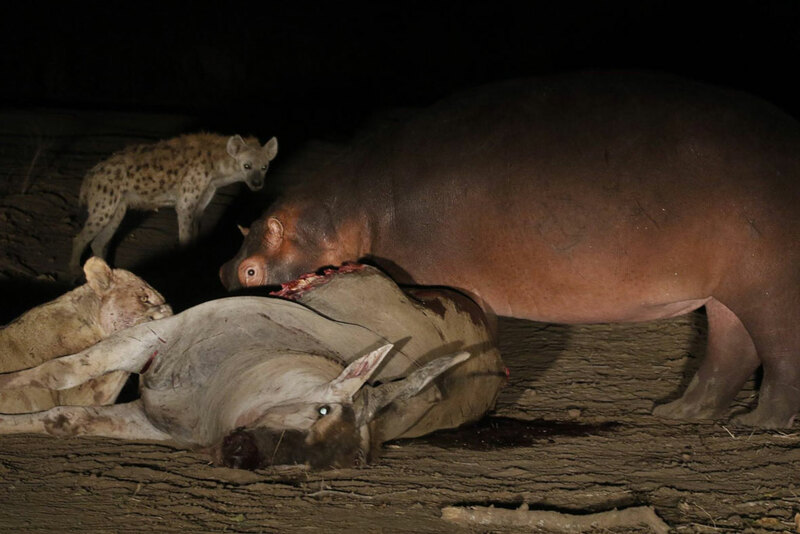 It's not unheard of for hippos to muscle in on meaty meals, although this one quickly realised that it lacked the equipment to actually bite into the eland carcass. "The lions were none too happy about the hippo’s arrival and tried unsuccessfully to chase it away," the couple writes. "One of them even resorting to swatting the hippo across the face." 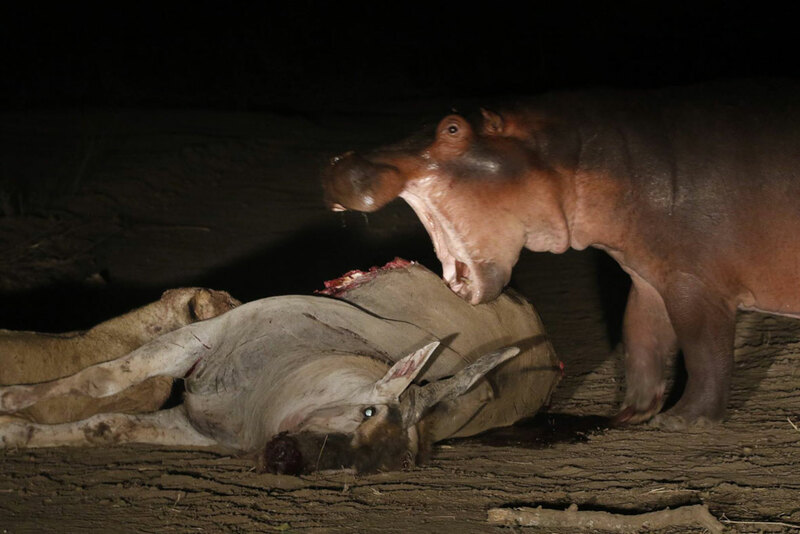 This is not the first case of carrion-craving hippo that has been caught on camera. In 2016 Rob Vamplew, a ranger at iDube Game Reserve, filmed a hippo chomping on the remains of an impala carcass. The antelope had been chased into the water by a pack of wild dogs earlier in the day and had fallen victim to a crocodile. 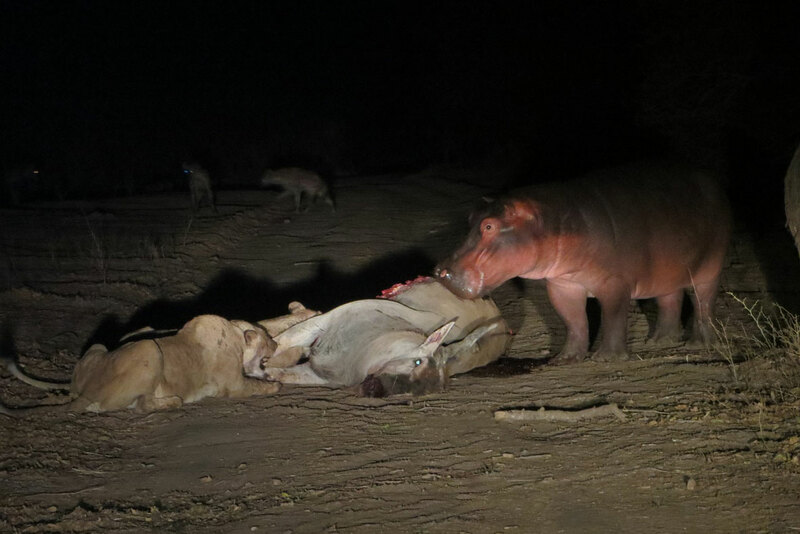 And in Pilanesberg Game Reserve, in February 2013, field guide Solomzi Radebe captured images of a hippo joining a pride of lions at a wildebeest kill. In fact, since the first known instance of hippos eating meat emerged from Zimbabwe's Hwange National Park in 1995, reports of similar behaviour have trickled in. Experts believe that the lumbering plant-munchers will be driven to scavenge meat only when their usual food is scarce – during a drought, for example. Similar to cows, hippos have chambered stomachs that work like fermentation factories, breaking down grass and extracting the necessary nutrients. They don't really have the anatomy for digesting meat. (For more on the science behind meat-eating hippos, click here). The hippo that stars in the latest case of herbivore-turned-rogue eventually moved off leaving the eland carcass to the lions and hyenas. "We fell asleep to the hungry screams of hyena and the occasional lion’s roar, and in the morning, we awoke to some very rounded lion and hyena bellies," wrote the Marais. 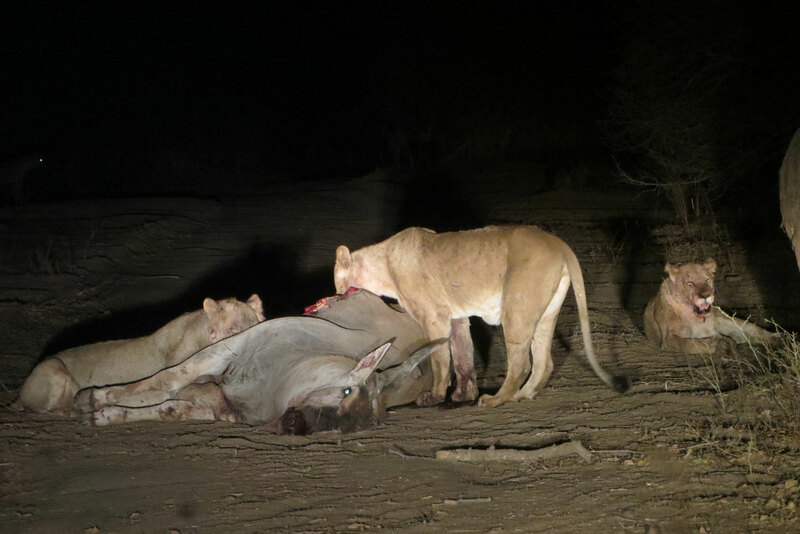 Here’s a meaty question: Why are hippos pushing in on lion kills in South Africa?